"Korea Able to Produce World-class W-CDMA"
EUCCK President Frans Hampsink delivers his welcome speech. The development of a series of innovative technologies from time division exchange (TDX) in the 80s to code division multiple access (CDMA) and the broadband internet since the 90s has established Korea as a global IT powerhouse. As a result, the IT industry has emerged as a key driving force of the Korean economy. 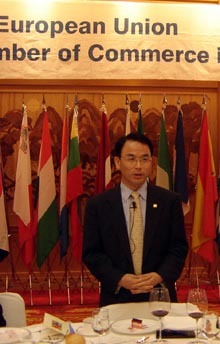 "Every problem has a solution, only if we perhaps change our attitude," said Minister of Information and Communication Chin Dae-Je in a luncheon speech held at the Ruby Room of Shilla Hotel in Seoul on April 7, 2005. Frans Hampsink, president of The European Union Chamber of Commerce in Korea (EUUCK), welcomed everyone for the seminar titled "Korean Information & Communication Technology Industry for the Next Decade." 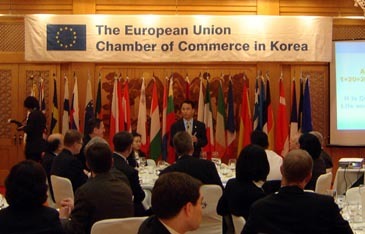 EUCCK was formed by a group of individual business executives from various European Union (EU) companies based in Korea, with initial financial support from the European Commission in February 1986. The purpose of the chamber is to help in any possible way in developing trade, commercial and industrial relations between the EU and Korea. The chamber paves the way for and fosters contacts between interested business circles of the 25 EU member states and the Korean Peninsula. EUCCK, a non-profit organization, is made up of around 800 member companies from the EU as well as the overseas business community. 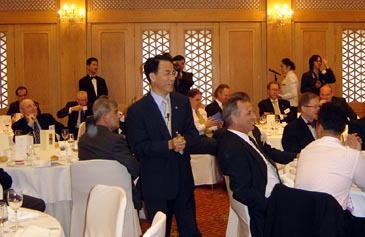 Various types of guests from the different organizations were present at the luncheon seminar, such as the secretary general of EUCCK, members from other foreign chambers of commerce in Korea, and members from different multinational companies. Among the guests were many ambassadors including Amb. Carlos M. L. Frota of Portugal, Amb. Michael Geier of Germany, and Amb. 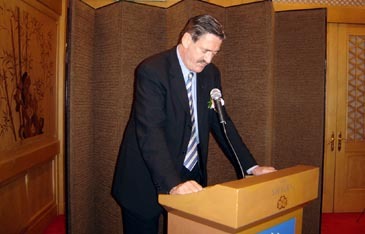 Kim Luotonen of Finland. Addressing to the president and secretary general and other distinguished guests, as a key speaker Mr. Chin Dae-Je said, "I should emphasize the importance of my appearance today as an invited speaker on the topic of 'Korean Information & Communication Technology Industry for the Next Decade.'" 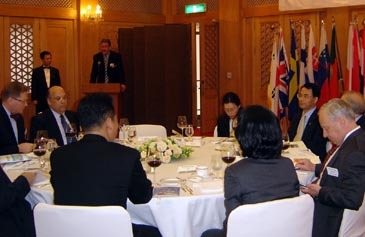 EUCCK President Frans Hampsink (back on the podium) speaks while Minister Chin Dae-Je (close to flags) and other guests are listening at the luncheon seminar held by EUCCK. He said that Korea's development strategy to adopt new IT services ahead of competitors, commercialize them and preoccupy the IT service industry turned out successful. "With a goal of developing a new virtues cycle, the Ministry of Information and Communication (MIC) of Korea drew up 'the IT839 Strategy," said the minister. Under the strategy, new IT services will be introduced and promoted to encourage investment in network infrastructure, which will bring synergic effects with cutting-edge devices, equipment, software and contents. "The MIC is committed to the implementation of the strategy to achieve 20,000 US Dollars Gross Domestic Product (GDP) per capita earlier than the original schedule," he said. 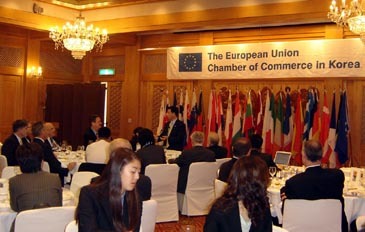 Minster of Information and Communication Chin Dae-Je delivers a speech in front of the guests during the luncheon seminar held by EUCCK in Seoul. Minister Chin then mentioned the implementation plan of the IT839 Strategy. The strategy will offer different services like Wireless Broadband Portable Internet (WiBro), Digital Multimedia Broadcasting (DMB), Home Network, Telematics, Radio Frequency Identification (RFID), Wideband Code Division Multiple Access (W-CDMA), Terrestrial Digital TV, Internet Telephone etc. In the network area it will support Broadband Convergence Network (BcN), Ubiquitous Sensor Network (USN), Next-generation Internet Protocol (IPv6). In the field of new growth engines, IT 839 Strategy has a plan for Next-generation Mobile Communications Devices, Digital TV/Broadcasting Devices, Home Network Devices, IT SoC (System on Chip), Next-generation PC, Embedded Software (SW), Digital Contents & SW Solutions, Telematics Devices, and Intelligent Service robot. Korea has an Ideal Test-bed Market for ICT. It produces 60,000 ICT experts annually. 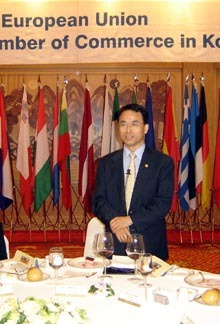 Large domestic market, world class ICT industry & infrastructures, over 22,000 companies in IT-related business, sharing the vision for globalization and economic growth, over five percent of GDP for national R&D spending, consumers in favor of innovative technology and products, and aggressive rollout plans of new telecom and broadcasting services are some key facts of Korean ICT Strength. Minister Chin Dae-Je demonastrates the new IT839 strategy. Korea has a unique geographical attraction. It has regional financial center and free economic zones for better investment especially in the field of ICT & Electronics, Automobiles, and Financial Services. As a scholar from the different universities both from home and abroad, Mr. Chin pointed out some important steps taken by MIC, which will encourage the foreign companies to invest in this IT hub of Northeast Asia. "Your investments are more than welcome," said the minister. Distinguished guests are listening to the minister's speech. 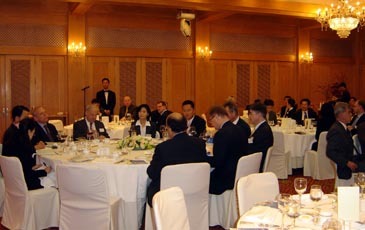 Minster Chin Dae-Je(standing) talks with the distinguished members of EUCCK during the luncheon seminar. Minister Chin Dae-Je(standing center) delivers his speech.